THE Bird Life Quilt here shown in miniature gives 24 patterns exact size for lovely quilt blocks. 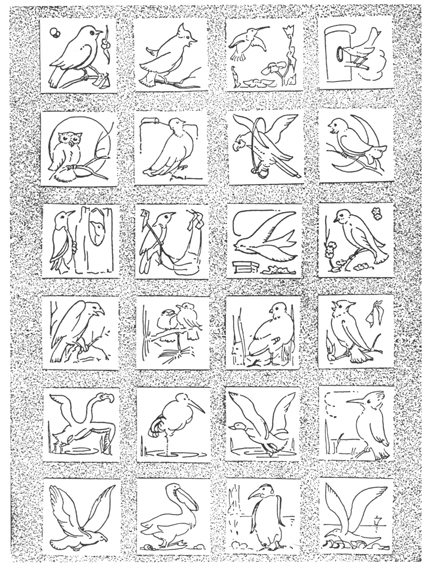 Each pattern is some favorite bird friend designed to fit a 9-inch square. As a special naturalistic color scheme comes with the pattern, you will have no difficulty in embroidering them; the work is mostly outline stitch with some wings and tails blanket-stitched to make a feathery edge. Wax transfer of the bird blocks as Number 402 at 50 cents for the set. Fifteen skeins of thread in all colors needed to work the blocks is Number 402T at 50 cents. It requires seven yards for the quilt top and we can supply this in best quality colorfast materials as No. 402M at $2.80. No. 402L is 2 1/2 yards of 81-inch sheeting for lining at $1.25. Twenty-four stamped blocks Number 402S, at $1.75.